A few pics from a crazed, fun day at Grandma and Grandpa’s house in Queens. This was Catherine at her Tol this past January. This was Luke at his Tol in July 2003. It was the only one where the camera caught him with the hat on. We bribed him with the enormous rice cake. This was Gregory today in his Pope hat (actually, it is designed from the Chosun Dynasty and is very regal). He was very good in it but we made sure he was mesmerized by the TV so we could get some good shots in. 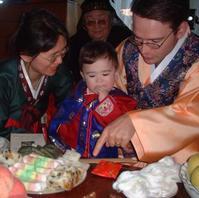 Catherine has grown into her hanbok, as you can see, mainly due to eating like a billy goat the past 11 months. I am biased of course, but she is unbelievably beautiful. See what I mean? She did better with the hat this year too. The Gang. Luke is upset about being dressed up. He doesn’t realize how sharp he looks. The birthday boy. I hope we all share many more. For the record, he went right for the paintbrush. In picking it up, he also snared the money and the string, a rare hat trick (bad pun). Three generations. Luke is happy to be free of formal wear. Mommy and daughter, with Grandma looking on. With my father in law’s illness, Grandma gets a great deal of joy from the little ones. Not a bad picture of Ann at all. This was his older brother’s first birthday. We are wearing han boks. his grand aunt rigged it with a shiny red envelope. downs, I favored Gregory having his own. The Boss permitted it. One thing we couldn’t do for the kid was to grow more hair for him, a department where his brother was clearly ahead of him at this point. For those of you keeping score, half korean redheads are slow hair growers. Each of my kids have unique ways of getting to me, and among Gregory’s is his more than passing similarities to his late uncle. Both share the same smile, warmth, and physicality. I am certain that had my brother enjoyed health, he would have been a better athlete than his three siblings combined. Gregory loves to chase balls around the room before he even walked. His uncle predicted that he would be an early walker, and he was. We are fortunate that we were all able to be together for most of this past summer. Happy birthday also to Oates, who was the best man at my wedding, is Ralph’s son and Catherine’s godfather.